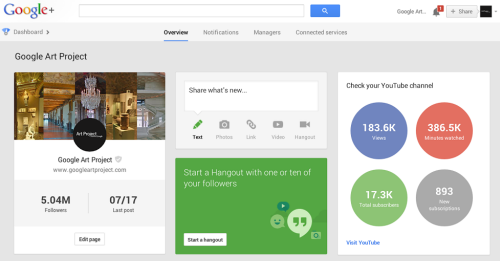 Google+ team has officially announced the addition of YouTube channel states in the Google+ Pages Dashboard. It was only a few days ago, that new Google Dashboard was introduced to make the page management simpler. YouTube statistics will include details of total subscribers, views, new subscriptions, and minutes watched. A link to their YouTube channel account will also be provided so that managers can get detailed information. To view YouTube channel statistics, you will have to link the Google+ Page with YouTube channel. Visit the advanced account settings, click "connect with Google+ page" and you will be given the option of creating a Google+ page with a different name or using your YouTube channel name. While announcing the update, Pavni Diwanji also stated that more updates related to connecting more Google products with Google+ will be coming soon.